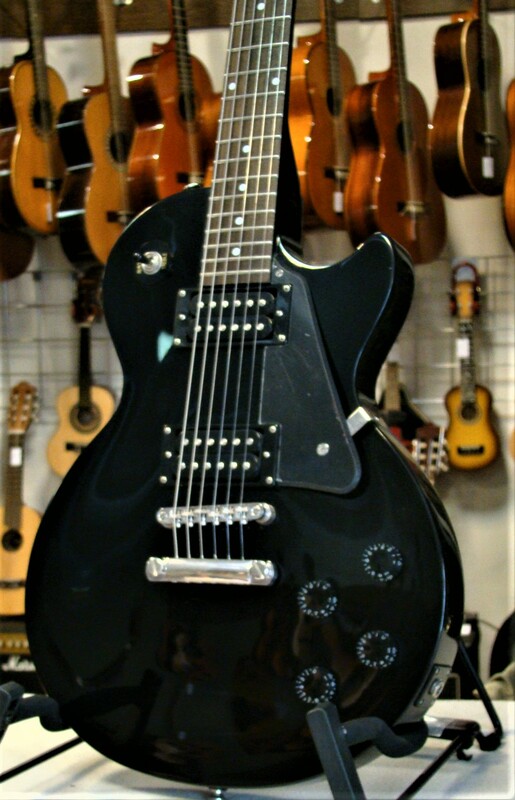 Les Paul Studio, LP-Shaped Guitar from Epiphone in the Les Paul series. 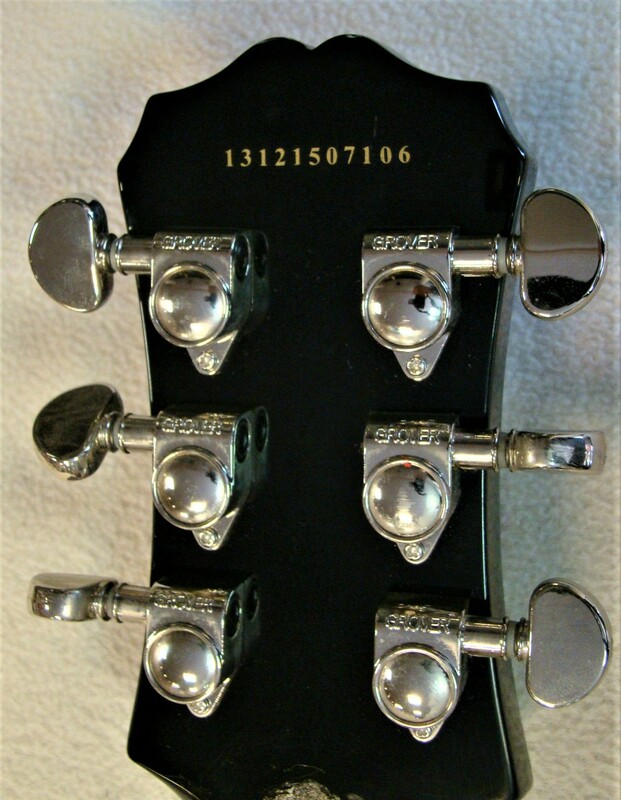 MGR/doctorfixit's review"Epiphone Les Paul Studio"
Pawn Shop. $180. The pickup selector switch had a bad connection & I replaced the switch. I had the frets dressed and I re-set the intonation myself after the setup man was finished with it. He hadn't got it right. This is a bolted-neck model. The pickups are the best part about the guitar. The humbuckers put out far more than single coils. With a little tube screamer for warmth it sounds wonderful. This unit has some intonation issues, it is on the verge of needing a compensated nut. Being a short scale, tuning will always be an issue. The open chords are always just a tiny bit off in the G and B string. As I say I think a compensated nut would help. The fretboard is just too flat. It almost feels concave. While good for chording, the flatness makes it difficult to play leads without catching the other strings, despite the wider fretboard. Above the 12th fret the lack of precision in the fretting makes the intonation get very sour, especially above fret #17 . You simply cannot do the very high leads with this unit. Stay in the neighborhood of fret #12 and you will be alright. It's solid. The finish is very nice, black, the hardware is fine, the bridge and the anchor are first class. The tuners are a little loose. The volume knobs are out of the way. The chord receptacle being under the bottom is hard to reach, you have to tip the unit up to get at it. nothing fancy, no edge bead, no big inlays. Not a bad unit for a beginner who wants a Les Paul appearance and not a cheap knockoff. It's not going to allow you to develop a very quick lead style because of the fingerboard limitations. Chording suffers somewhat from intonation issues due to the short scale and lack of precision fretting. If you tune to the bar chords and play power chords it will crank some very fine sounds. MGR/Fabian Spoelman's review"Epiphone Les Paul Studio"
I'm 21 years old, born and risen in Haulerwijk, Netherlands. I play guitar for about 6 years now, and I'm in a band called Thanks4Nothing (www.thanks4nothing.nl). We play a whole variety of covers from artists such as ACDC/Guns & Roses/Nickelback/Status Quo etc. I bought this Les Paul at a local guitar shop for about 400,-. I traded in my Ibanez Ergodyne series, as I'm sick of getting my guitar detuned due to the Floyd Rose system. 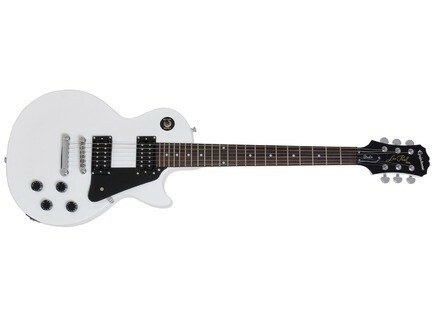 Above that, I like a Les Paul sound way more then a Ibanez sound, since I play classic rock mainly. I really like everything about this guitar. Body, neck, tuners, bridge. A lot of people think the tuners look awful on this guitar. Well, I don't. I think the creamy greens look kinda vintage on this Les Paul, and they really stay in tune for a long. long time! The pickups are great, not noisy, and the bridge pickup just sounds superb! Like I said, it's very solid. It stays in tune great, its sounds amazing. Sometimes I dont believe its just me playing this thing :D I have it in combination with a Behringer Blues Overdrive stompbox and a Marshall VS65R Amp. 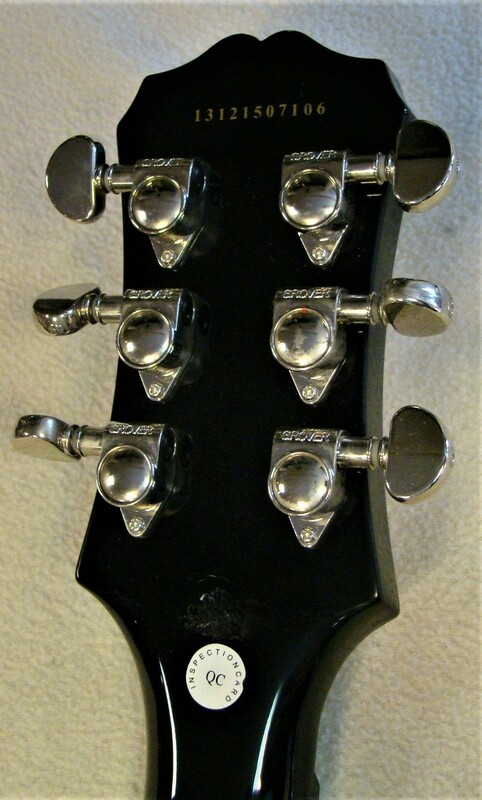 MGR/Johnny P's review"Gibson Les Paul Studio"
tuners finish and all the plastic parts are crap. good basic construction but the finish ain't great. MGR/Ernie's review"Gibson Les Paul Studio"
I bought this Guitar for myself as a present for not smoking for one year. I picked it up at the Guitar Center in Cherry Hill New Jersey. I paid almost $1,300. The finish almost looks as though it has depth to it. The color is transparent enough that just the right amount of grain shows through. The electronics speak for themselves when plugged in. The Action is typical of Gibson (Outstanding). The tone and sustain from this Guitar are about as good as it can get. The factory strings are good enough to keep. Haven't found anything wrong to make a comment here. The contsruction of this Guitar is solid. It has a Mahogany Body with Maple Top. Wine Red color with Gold Hardware. Humbucker Pickups Gold Speed Knobs, Gold Tun-O-Matic Bridge and Tail piece. As for quality of this Guitar I'd give it on a scale of 1 to 10 a 10. Nice investment, Not only for the money but the future of playing. This Guitar is built to last a life time. Very wise choice.